Six picks in a pack, and 4 different designs. 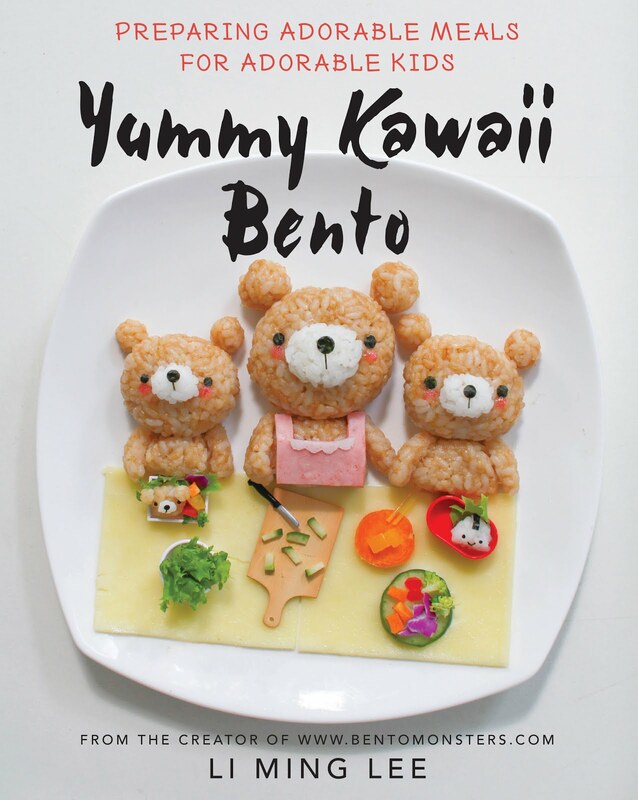 :) I actually have another bento in mind for these picks, I'll share next week. 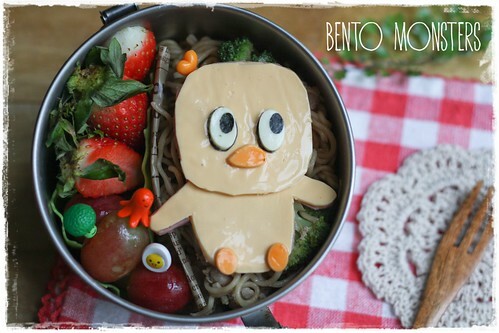 They seemed to suit today's bentos too, so I decided to use them first. 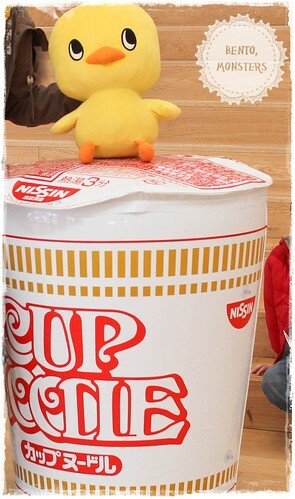 Hiyoko-Chan on top of instant noodles. 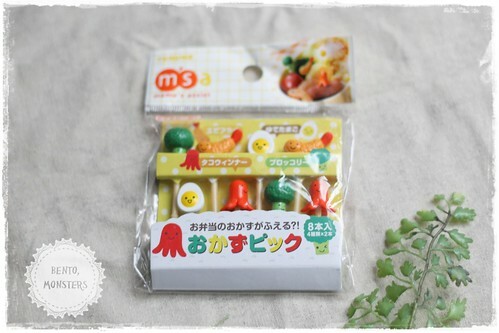 Lol, I thought instant noodles will be most appropriate for a Hiyoko-Chan bento. 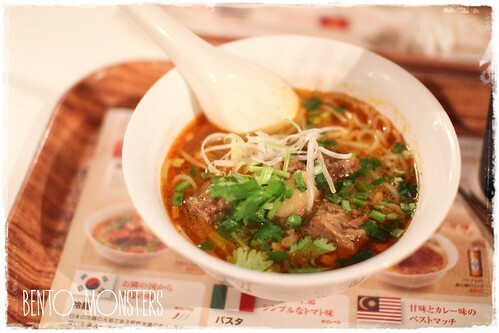 Instant noodles are stir-fried with pork and broccoli. I added grapes and strawberries as well. 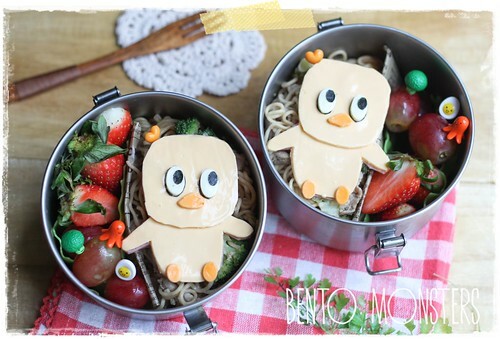 And here's the inspiration for my chick today, it's a lot cuter than my version, I think I placed the chick's eyes a little too close on my bento. And pardon the picture, I did not have a picture of just Hiyoko-Chan, so I had to crop us out from the photo. LT drawing on his. 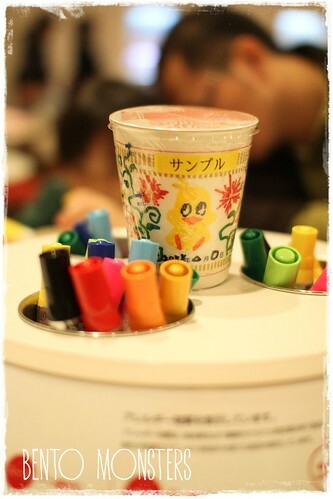 The markers are so nice, lovely colours. 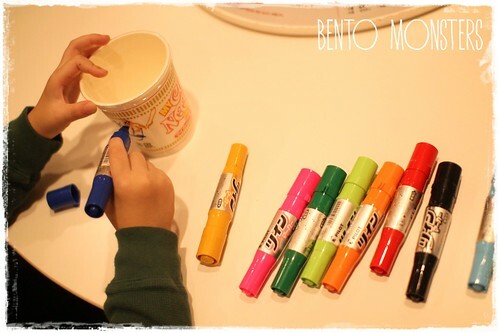 IT decorating his cup noodles. 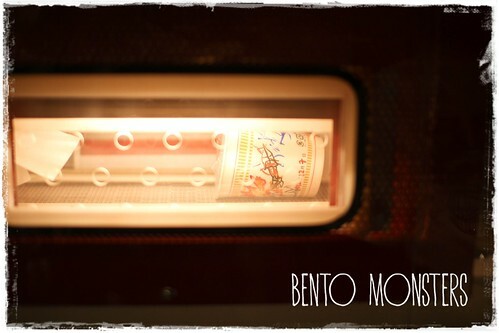 After it's done, they brought it over to the counter to fill it with noodles. 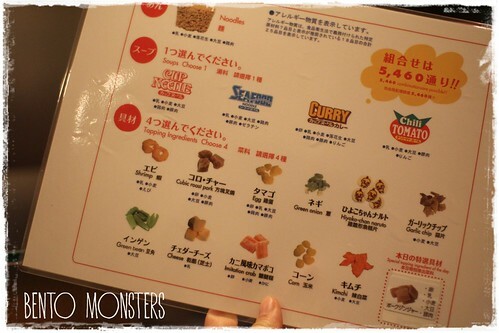 They get to choose the soup base and 4 ingredients. 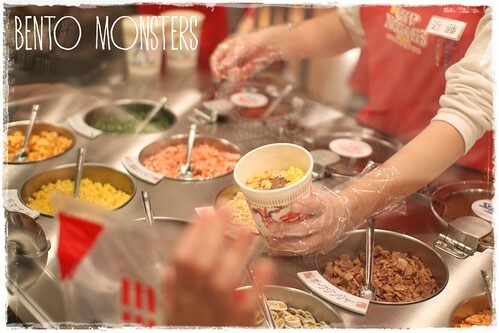 The staff will fill up the cup noodles with their chosen ingredients. Sealing it up. Almost done, but one more step to go. 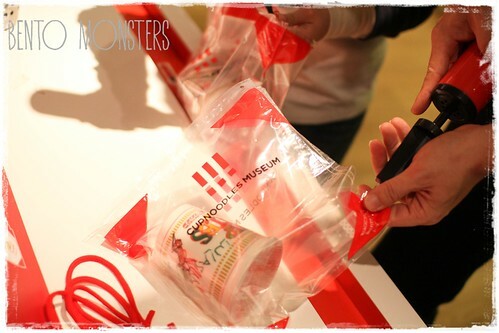 Pumping air into the plastic bag that holds the cup noodles. And they could sling this on their shoulder. 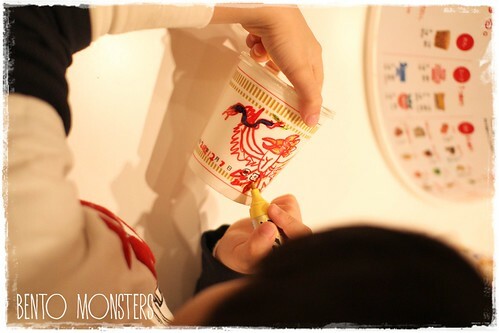 The boys could not wait to eat the cup noodles, and they had it for supper that very night. The museum had this food court that serves noodles from different countries. 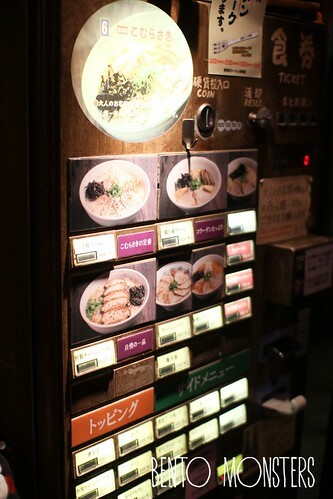 We were quite skeptical about the food but surprisingly the noodles tasted quite good. 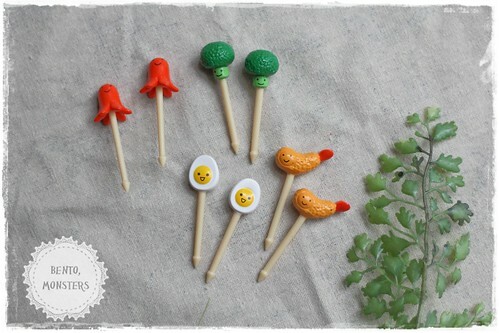 We all chose the noodles we wanted, they come in small servings. 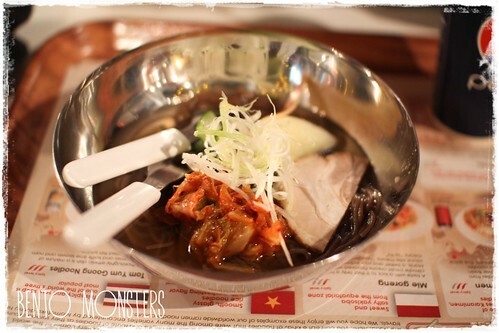 IT chose Korean cold noodles. 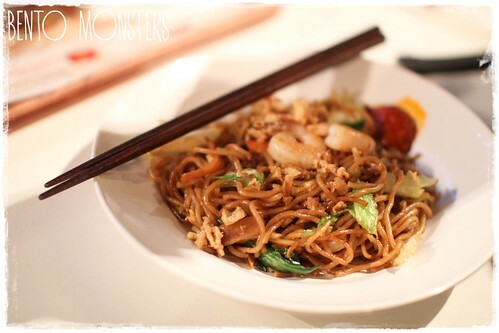 Daddy chose this, I forgot what it was, mee goreng I think. The sambal was surprisingly nice. 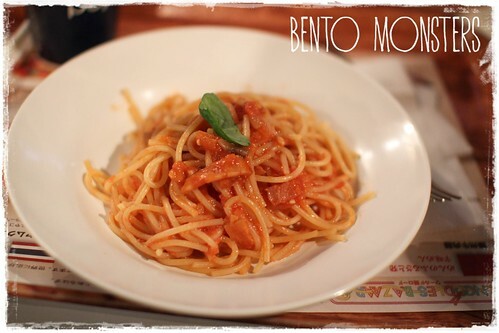 We were still not full after the noodles since it was not the usual full serving. 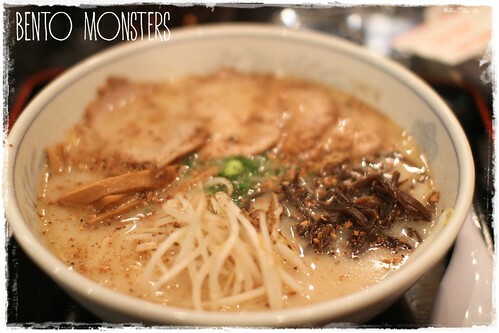 We were craving for ramen. 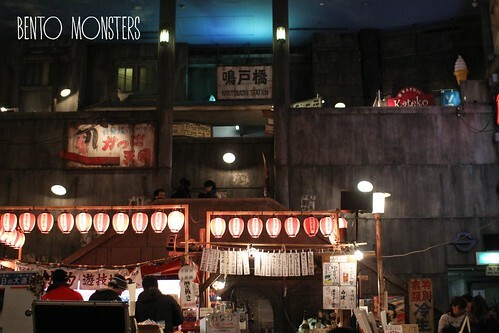 So, we went down to Ramen Museum for more noodles. 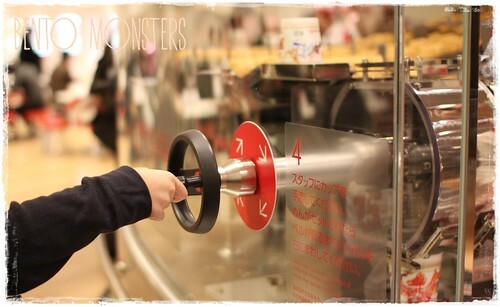 Even the ticketing machine is so nogalistic looking, as compared to the usual ones.